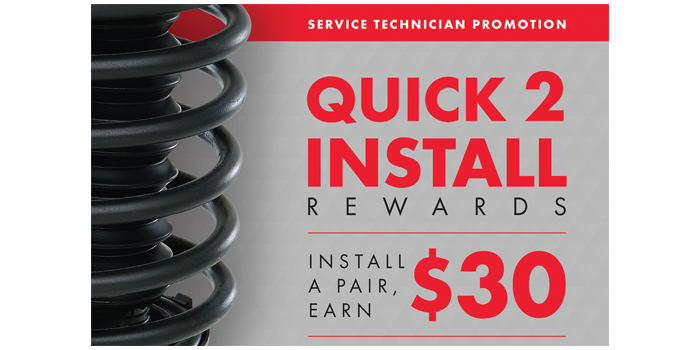 The Monroe “Quick 2 Install Rewards” promotion ­is providing some extra incentive for service providers who choose Monroe Quick-Strut replacement assemblies for their ride control jobs. Through the program, service providers can earn a $30 Visa Prepaid Card for each pair of qualifying Monroe Quick-Strut replacement assemblies sold in September and October. The Monroe “Quick 2 Install Rewards” Visa Prepaid Card scorecard promotion is available through Oct. 31, for sales of qualifying pairs of the ready-to-install replacement solutions. During the same promotional period, the Monroe brand is offering the Shocktober program that enables consumers to get four qualifying Monroe units for the price of three. Consumers who qualify for the offer will receive a Visa Prepaid Card equal to the lowest priced unit, up to the current suggested list price, by mail. Monroe says its Quick-Strut assemblies are precision engineered, assembled, fit-checked and tested on each corresponding vehicle model to verify that they will help restore proper ride height and OE-style ride and handling. Each genuine Monroe Quick-Strut assembly features a premium OE-style upper strut mount and bearing plate; premium upper spring seat; application-engineered coil spring manufactured from U.S.-grade steel; premium boot and bumper kit; high-quality upper and lower spring isolators; and a premium Monroe strut designed and built to help provide OE-style ride and handling. Each Monroe Quick-Strut assembly is offered with Tenneco’s 90 days cash-back satisfaction guarantee and a limited lifetime warranty. Completed program scorecards and copies of sales invoices must be postmarked no later than Nov. 30. Participants can earn up to $500 through this promotion. 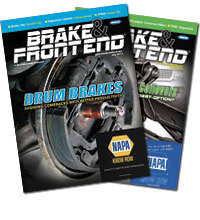 For additional information, contact a Tenneco sales representative and/or Monroe parts provider.